Fruit gum with 10% fruit juice. Natural colours. Fruit juice. Vegetarian recipe. Gluten free. 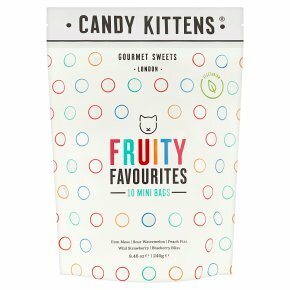 Suitable for vegetarians.We're Candy Kittens and we believe that life's too short for boring sweets! We're leading the way in British style and taste, making gourmet sweets for you to enjoy... The Sweet Way. Fruity Favourites what's inside? Eton Mess We've reimagined a classic British recipe! These guys are very indulgent... Sour Watermelon Because watermelon wasn't cool enough. We're sure these wonders will tingle your taste buds! Wild Strawberry We've all got a wild side... these beauties taste much better than the originals! Peach Fizz The bubbliest sweet of them all. This new recipe is sure to put a fizz in your step! Blueberry Bliss Blueberries aren't just for muffins. These sweets can only be described in one way: absolute bliss!